Sometimes things work out great and sometimes.... they don't. Whether it's the cold weather (but not a single flake of snow), a string of bad dates, or too much wine on a weeknight that's getting me down, this month needs as much warm comforting cheer as possible. But I'm also a million pounds heavier than I was before the Christmas holidays, so I need warm comforting things that will make me feel good about my life choices. Enter almond milk. Or any nut milk really. Despite being super easy to make, I always feel strangely accomplished when I make it (even if all I do after is sit on the floor with my roommate and hide from life). The recipe for all nut milks is generally the same. Soak some nuts, blend 'em, and strain. But you can add different sweeteners/flavors depending on your taste preference. It's not always cost effective, but you can use the the ground nuts in baking and, believe me, the taste difference between fresh and store bought almond milk is astronomical. Soak the almonds in water over night. Pit and chop the date. 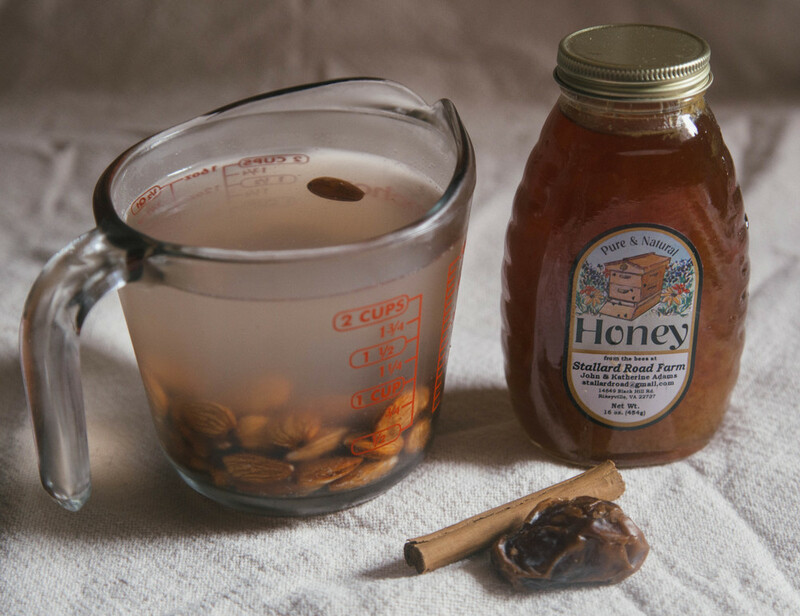 Drain the almonds and blend with 3 cups fresh water, date, and salt. Once mixture is smooth, strain with a sieve or cheesecloth. Heat the milk (on the stove top or in the microwave). Stir in the honey and add the cinnamon stick. Enjoy.